DotA 2, or Defense of the Ancients 2, is a sequel. The original game is a Warcraft 3 mod that became so popular, it spawned a genre. Just like tower defense games were popularized in Warcraft 3 and Starcraft, Defense of the Ancients invented MOBAs. 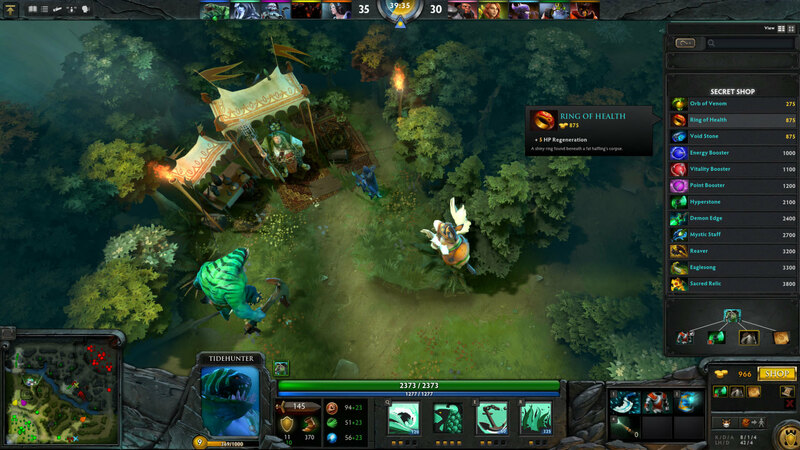 DotA 2 is a separate game available through Steam and developed by Valve. While their claim to the term “DotA” may be tenuous, as some of the original DotA developers went and formed Riot Games, who made League of Legends, DotA 2 exists, and Valve made it. Whereas League of Legends is an original IP, DotA 2 is bound to the designs of its past. DotA 2 is a much prettier version of its prequel, one that runs on its own engine, yet one that has the exact same characters and the exact same abilities. DotA 2 is a Multiplayer Online Battle Arena, or MOBA. Two teams of 5 try to advance on the enemy base and destroy it. This style of play has been seen in League of Legends, Guardians of Middle Earth, and Rise of Immortals–may that last title rest in peace. 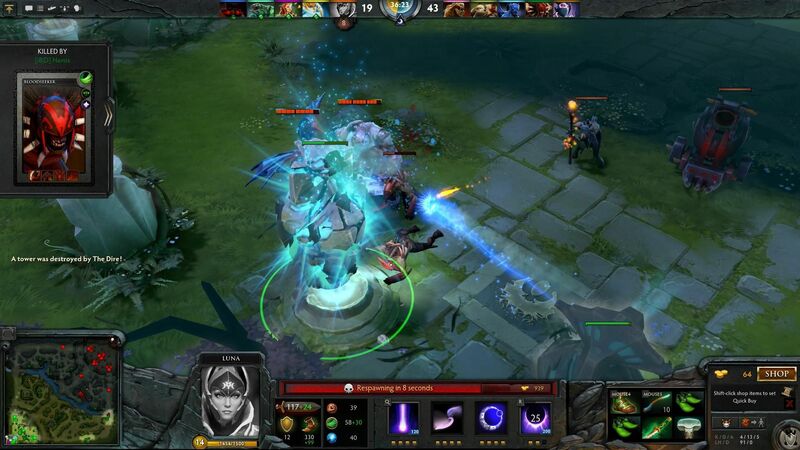 Unlike some other titles, DotA 2 has no mechanism for advancement outside of the game. There is no summoner level, no stat-altering runes, and no character masteries to set. You also don’t have to spend any in-game money to unlock characters; everyone is available to you from the start. Characters have a wide variety of appearances and names. There’s the Omniknight, the Dragon Knight, the Sniper, and Sven, just to name a few. We’re not really told what kind of warrior Sven is. He is Sven. The problem I have here is that there seems to be a general malaise when it comes to the playable characters. One of the characters in the original DotA is the lawsuit magnet Lina Inverse, who is a character from an anime called Slayers. In DotA 2, she is brought over as Lina the Slayer. None of the playable characters seem to have any discernible personality from a single look. In game, the presentation is another story. Every character has unique voice work, and some characters even interact with characters on the other team, teasing and taunting each other. Not only are the characters featured in DotA 2 the same as from the original Defense of the Ancients, but their abilities are exactly the same too. Not one finger has been lifted to alter these characters from their original incarnations. For better or worse, characters have the exact same moves as they existed in Warcraft 3. And I say it’s worse. In a game like League of Legends, everything a character can do feels awesome. One character in LoL has multiple ways to deal damage. Often, these abilities complement each other in obvious and fun ways. For example, in that game, Draven can throw a spinning axe at an opponent, which he can catch and throw again at no cost. He also has the ability to run faster for a short period of time. However, if he catches a spinning axe, he can immediately start running faster again, creating a fun aspect to his game play around trying to position yourself to catch the axes you throw at a fleeing enemy. On DotA 2‘s side, we have Sven. One ability causes damage to enemies in an area, and stuns them. The other three abilities give him buffs to damage radius, move speed, armor, and damage. That’s it. This is not an exciting or impactful character design. Once you enter a game of DotA 2 and you start earning gold, you’ll be able to return to your shop and buy items to improve your character. In League of Legends, items are sorted by a variety of stats, and a search filter can be used to dial down to the exact kind of item that you want. In DotA 2, there is no item filtering mechanism. You are left to fend for yourself to find what you need. Hopefully, you already know where it is. Being bound to Warcraft 3, items improve one of three stats, Strength, Agility, or Intelligence. Improving them increases hit points, attack speed, and mana points. Improving the one that is your primary ability also increases your damage. This is exactly the same as Warcraft 3. Most high end items also can be activated to give a temporary benefit, such as increased damage for a limited time. There are also consumable items to give you a quick boost of hit points, return you to base instantly, and there’s even an item that allows you to eat trees to gain health. Forget that for most characters, eating trees is ridiculously out of character. It’s a mechanic based on an ability Night Elf buildings have in Warcraft 3, to let them eat trees to gain health. This design discord might fly in a Warcraft 3 mod, but not in a full game. That header isn’t a joke. DotA 1 is actually still updated to this day. Whenever a balance patch is applied to DotA 1, Valve works as quickly as possible to integrate those changes into DotA 2. Upon discovering this, I was left dumbstruck. What is the point of DotA 2 then? DotA 2 offers matchmaking features, league support, tutorials, in-game guides, the ability to utilize recommend character builds, and a store with thousands of community-made items to customize the look of your hero, all for a price. Heck, there are even treasure chests which you’ll need to buy a key to open a la Team Fortress 2. But all of that is window dressing on a game that is not only no different from its predecessor, but a game that cannot or is unable to change. Now I admit, DotA is a solid enough game. The core mechanics are sound, and have been for years. Skill is rewarded, and kills do feel satisfying. Every MOBA since DotA owes it gratitude. But every MOBA since then has also made their own changes and design decisions in the name of what the developers think is right. DotA 2 has literally done nothing. Ted got into the beta for DotA 2 a while back, but didn’t really play it. He has been evaluating it for several weeks now in order to write this review. He received no support or consideration from Valve.